Posted on November 10, 2013 by Joshua Prince, Esq. Recently, I have seen a number of people posting approved eForm Applications (Form 1’s), which had me greatly concerned given the translucent nature of the newly utilized electronic stamp. After receiving these approved eForm Applications by email, some of the applicants have called the NFA Branch and been told that they will not be receiving a hardcopy and that the electronic copy is their approved tax stamp. While, as explained below, there appeared to be….wait for it…a loophole in relation to Form 1 Applications, as made explicitly clear by 27 C.F.R. 479.162, ATF’s newly utilized electronic stamps are unlawful and invalid. To start, everyone is generally aware that 26 U.S.C. 5811 (dealing with transfers if of NFA firearms) and 26 U.S.C 5821 (dealing with making NFA firearms) require the payment for and receipt of a tax stamp for the transfer and making of NFA firearms. Both hold, “The tax imposed by subsection (a) of this section shall be payable by the appropriate stamps prescribed for payment by the Secretary.” Before moving on, so that everyone is clear, the provisions of the National Firearms Act (NFA) discussed below refer to the “Secretary” rather than the “Attorney General”; however, the relevant powers and functions of the Secretary of the Treasury were transferred to the Department of Justice, under the general authority of the Attorney General, pursuant to 28 U.S.C. 599A(c)(1). Under the Internal Revenue Code, 26 U.S.C. 6801, “[t]he Secretary may establish, and from time to time alter, renew, replace, or change the form, style, character, material, and device of any stamp, mark, or label under any provision of the laws relating to internal revenue.” Section 6804 goes on to declare, “Except as otherwise expressly provided in this title, the stamps referred to in section 6801 shall be attached, protected, removed, canceled, obliterated, and destroyed, in such manner and by such instruments or other means as the Secretary may prescribe by rules or regulations.” Thus, the question becomes, what has the Secretary established, or to whom has he delegated the power to, and what is meant by attached. As one would expect, Section 6808 then goes on to inform the reader that for special provisions relating to the NFA, to see Chapter 53. So, we need to turn to Chapter 53 to find our answers. In turning to Chapter 53, we are, in part, back to where we started with Sections 5811 and 5821, which mention a tax stamp but do not define it in any meaningful manner. Thus, it is now time to turn to the Code of Federal Regulations. Hence, under both, there are two requirements. First, it must be an adhesive stamp. Second, it must bear the words “National Firearms Act.” I already see an issue with the above-posted example of a recently approved eForm 1. There is no adhesive stamp. However, if you look very closely, the words National Firearms Act, although blurry, do appear to be part of the electronic stamp. Except as otherwise provided in this subpart, no firearm may be transferred in the United States unless an application, Form 4 (Firearms), Application for Transfer and Registration of Firearm, in duplicate, executed under the penalties of perjury to transfer the firearm and register it to the transferee has been filed with and approved by the Director. The application, Form 4 (Firearms), shall be filed by the transferor and shall identify the firearm to be transferred by type; serial number; name and address of the manufacturer and importer, if known; model; caliber, gauge or size; in the case of a short-barreled shotgun or a short-barreled rifle, the length of the barrel; in the case of a weapon made from a rifle or shotgun, the overall length of the weapon and the length of the barrel; and any other identifying marks on the firearm. In the event the firearm does not bear a serial number, the applicant shall obtain a serial number from the Regional director (compliance) and shall stamp (impress) or otherwise conspicuously place such serial number on the firearm in a manner not susceptible of being readily obliterated, altered or removed. 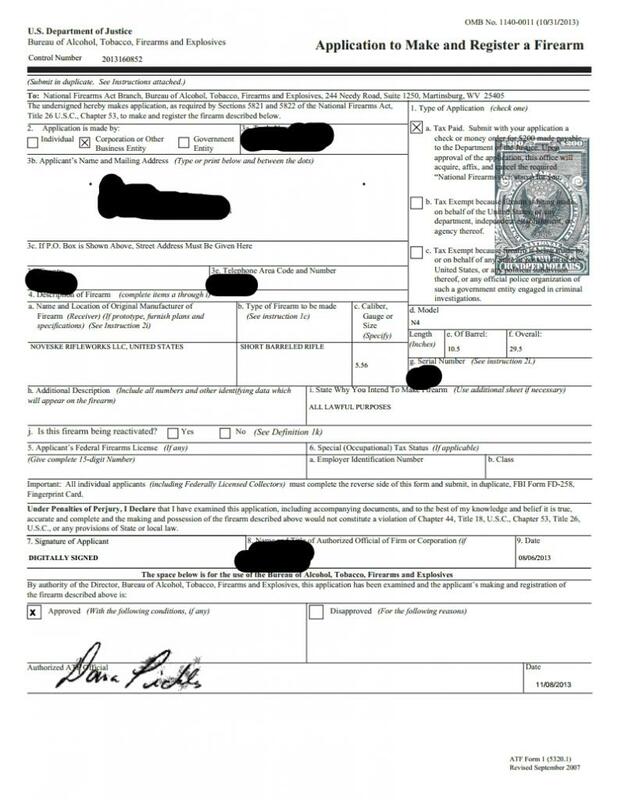 The application, Form 4 (Firearms), shall identify the transferor by name and address; shall identify the transferor’s Federal firearms license and special (occupational) Chapter tax stamp, if any; and if the transferor is other than a natural person, shall show the title or status of the person executing the application. The application also shall identify the transferee by name and address, and, if the transferee is a natural person not qualified as a manufacturer, importer or dealer under this part, he shall be further identified in the manner prescribed in §479.85. The application also shall identify the special (occupational) tax stamp and Federal firearms license of the transferee, if any. Any tax payable on the transfer must be represented by an adhesive stamp of proper denomination being affixed to the application, Form 4 (Firearms), properly cancelled. While not overly beneficial, I do find it hard to comprehend how the director maintains, in this context, a tax stamp, which is not tangible (aka an electronic NFA stamp, which could be easily stolen, emailed out, used illegally…but I digress). Again, we see the language “affix” but that by itself, I’m not sure is sufficient. Seems pretty clear to me. Only adhesive stamps can be utilized. The translucent electronic stamps are not the adhesive stamps that have been prepared. They aren’t even adhesive! So what does this mean? It means that ATF has to comply with the law (it wrote by the way) and issue paper copies of ALL approved forms requiring a “tax stamp” with an adhesive NFA stamp. Some may inquire as to why I am concerned with this and there are several issues. While I believe it may constitute a crime under the Tax Code, as it is NOT a valid stamp that they have been inserting on the forms, my concern stems from the translucent appearance of the approved eForm. What law enforcement officer is going to believe that it is real? I will bet that any LEO, not aware of this issue, and being presented with a printout of an approved ATF eForm will believe it to be a forgery and proceed to arrest the individual for not only possession of an unregistered NFA firearm but also making false statements to law enforcement, forgery, counterfeiting government documents…and the list goes on. This was extremely ill-conceived on ATF’s part and needs to be rectified immediately. If you have received an approved electronic eForm, I would suggest contacting the NFA Branch. If they refuse to issue you a paper copy, I would suggest contacting your Congressional Leaders, as ATF is violating the law it wrote…. Previous Post UPDATE !!! Governor Corbett Signs SB 648 Into Law – Landowners Protected At Last !! While technically significant, is this practically significant? I don’t think the probability of prosecution is high. On the issue of law enforcement having an issue with seeing a digital copy of the stamp rather than the actual stamp, haven’t they been looking at photocopies of the forms for years anyway? 99% of people who have Title II firearms only carry around a photocopy of the form anyway, not the original. Personally I only carry photocopies of my forms and I’ve never had an issue. Granted, I’ve never had to furnish to forms to law enforcement but I’ve shown them to range masters time and time again, without issue. Right but if you were asked to verify the stamp. Where would you pulled that out of? You do realize, this is not talking about the stamp for the letter you mail it to them with? This is referring to the stamp the BATFE mails you after efile form is approved. This stamp now allows one to make the NFA device. You keep that forever. Pingback: Things of interest and note from the recent ATF eForms bulletin | Prince Law Offices, P.C. So what do we do about it? If we demand a form printed with an adhesive stamp affixed and they don’t provide it, are we then faced with prosecution? Wow 3 months on the above form 1. Has anyone brought this up with the NFA branch? I just got a form 1 approved today and received the emailed stamp. This is concerning. No one is ever required to show police enforcement the original Form 1 or Form 4. It is only required to keep in possession a copy of such document. Police enforcement do not have a legal right to require the original. If the BATFE is requesting for such documents, a copy of the electronic version received can be proven to not be a fake by calling in the serial number for validation. True the rules written by the ATF need to be correct to match their current operations, but I seriously doubt there is worry for wrongful prosecution. You are incorrect because you are not considering state law, which varies between states, and in some states DOES require that the possessor provide a copy of the approved form upon demand. That may be true to a point, but many states follow federal law when it comes to legal definitions and NFA items. The BATF clearly states that an approved Form 1 or 4 must be presented to an ATF official upon demand. Nothing is mentioned about state or local LE. In fact, most average LE officers don’t even understand state law, let alone federal. It would be very difficult to prosecute someone for possession of an unlawful (unregistered) NFA item when the information can be easily verified with the NFA Branch and they would attest to the fact that the form in question is the new eFile version. I received an approved eForm-1 on December 4th. I too thought the pdf version sent to me looked fake. I initally became concerned about the looks of the approved form because my local range checks all Form1/4’s before allowing NFA items to be used. I’m more concerned that an RSO will wrongfully contact a LEO. I had incorrectly assumed I would be sent a hardcopy in the coming days. With no hard copy received, I spoke with the NFA Branch today. I was told, like many others, that I would receive nothing further and that the approved form I received was legally sufficient to make the firearm. The thing is, the gentlement I spoke to today seemed bewildered as to why I would even call to inquire about this issue. However given the issue stated here (which I found by googling for 30 seconds) I have to imagine that he has received this exact question more than once before. I have not proceeded to make the firearm because I was waiting for the hardcopy. It seems as though I will continue to wait until I contact my representative. Pingback: Eforms, blessing or curse? Does not the sale and purchase of firearms affect interstate commerce? It says “any transaction”, which would include a transaction between an individual, corporation, or trust and the USG, no? And does not USC supersede CFR, as the former is codified and the latter regulatory (and what the delegator giveth, the delegator can taketh away by writing specific Code)? Pingback: Eform approved but no stamp??? I think this pretty much give the BATF discretion…. I have an idea: let’s make a mountain out of a molehill. After all, I’m sure the ATF would love to cancel everybodys stamps because they are invalid and make all of us felons and collect another $200 from each one of us to make it right. That’s the only thing you hope to accomplish by this, is anyone who follows NFA stuff knows the ATF never admits fault to anything, they will simply punish the stamp holders. Is a LEO of 15 years myself I can tell you we know about the eform 1s, many of my colleagues along with me possess several. If you want to focus on what the ATF is doing wrong let’s focus on the fact that all of this tax stamp nonsense to possess a firearm is a violation of our 2nd Amendment anyway. For $200 I want the real physical stamp. I agree. I want the stamp. It’s like a trophy. After receiving my PDF and realizing that I’m not getting a real stamp, I was disappointed. Given the U.S. Supreme Court’s decision in Abramski, which seemingly held that materiality is no longer a factor, I am sure the above comment was posted strictly for informative purposes and is not advising modification of a Government document, even if that modification is not being done for unlawful or illegal purposes. Print out the e-stamped form 1, slap some glue on the back and paste it on a blank form 1. So now it’s a tax stamp approved by the ATF and it is adhesive.